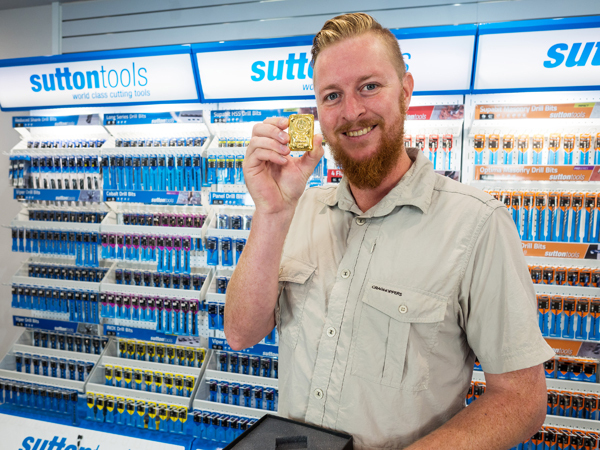 Melbourne November 27, 2017 – The lucky winner of the Sutton Tools 100 years anniversary competition Thomas Farrow is $10,000* richer, collecting a haul of 24 carat pure gold bullion. At the prize presentation at Sutton Tools in Melbourne, a happy Thomas purchased a Sutton Tools 100 Year Drill Set from Bunnings Wallsend. “Working in pest control, I use drills for termite inspection as well as personal DIY projects”, Thomas said. 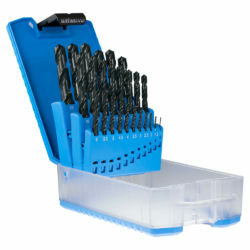 “It was my first Sutton Tools drill set, which I purchased because I was tired of using cheap drills that always broke. My reason for buying Sutton drills was they were Australian Made and the fact the company had been around for 100 years”. “I had just completed a termite inspection when the call came that I had won the prize. I was really taken aback, wondering if it was a prank!”, Thomas said. Presentation of the gold bullion grand prize caps off a year of centenary celebrations for this Australian manufacturing icon that ran monthly draws throughout the year for people who purchased special anniversary drill sets. 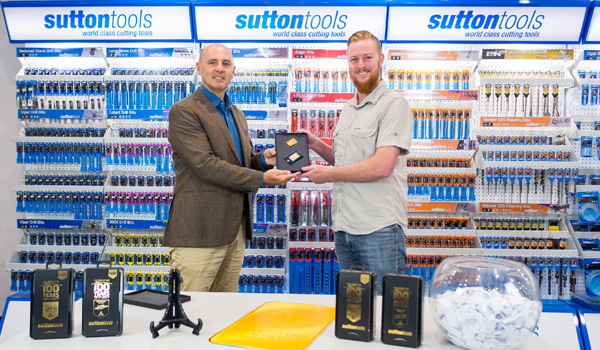 Monthly prize winners of Sutton Tools products valued at $1,000 were from Victoria, Western Australia New South Wales, South Australia and Queensland. Specially labelled limited-edition anniversary drill sets formed part of a merchandising campaign at participating hardware outlets and tool retailers throughout Australia. By purchasing any of the two Limited Edition Anniversary Drill Sets, customers were eligible to enter a monthly major draw for prizes worth up to $1,000 of Sutton Tools products. Purchasers of the limited edition anniversary drill sets were also eligible for the grand prize draw of 24 carat pure gold worth up to $10,000. The family owned company has always been a champion of Australian manufacturing. In 2008 Sutton Tools received the official accreditation by the Australian Made Campaign and in 2009, induction into the Manufacturing Hall of Fame. Sutton Tools started in Melbourne in 1917 and today is a multi-national 100 percent Australian family owned business, renowned for its high-quality power tool accessories and cutting tools for a wide range of trades and specialised industrial applications. Sutton Tools produces 16,000 product lines and exports their tools to 40 countries. Products and services are used by industries that include precision engineering, automotive, aviation, energy, medical, mining and more which are supplied with blades, drills, threading taps and end mills.